Invoke the unique charm of Hawaii. Featuring palm trees, surf and sun, this colorful Hawaii Poster was designed to capture the essence of the Aloha State! 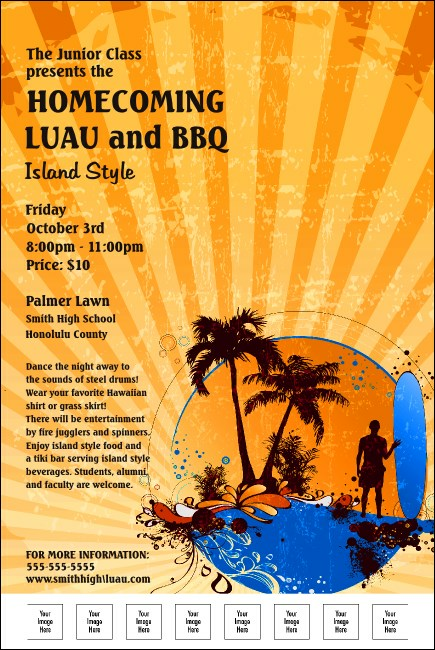 Excellent for Hawaiian themed events, the poster template features space to upload eight custom images to promote sponsors or performers. Wish you had more time to spend at the beach? Ordering through TicketRiver.com.au is fast and simple!